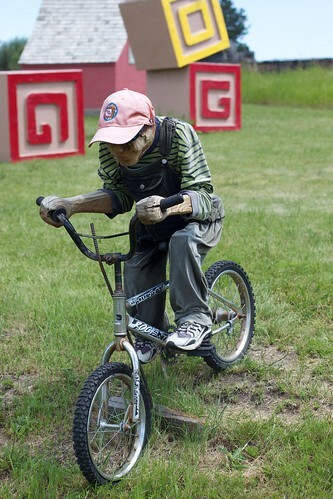 Here is another genuine character I met on the road recently. Going past the road to tiny Cottonwood, Idaho, a giant wooden beagle on the left caught my eye; how could I pass up the sign for Dog Bark Park? 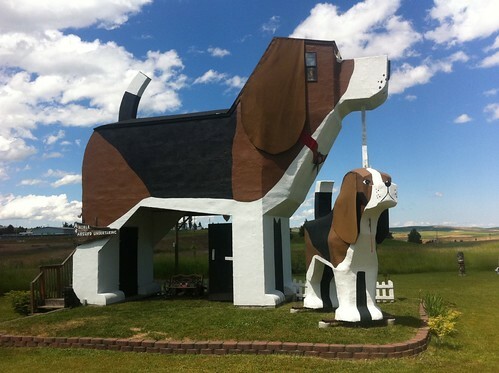 The big dog is actually a multi-story B&B- yes, you can arrange so spend a night (or more) inside a giant dog house- a house shaped like a dog; see http://dogbarkparkinn.com/. 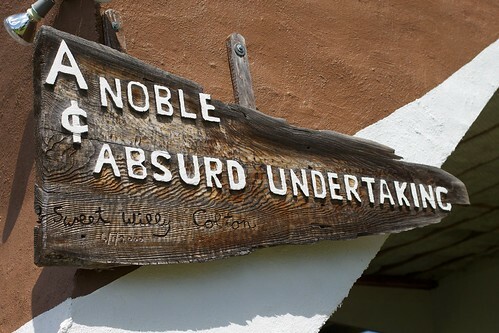 The big one is “Sweet Willy”, and is adorned with a sign that reads “a Noble & Absurd Undertaking.” (the little companion, Toby, is 12 feet high). 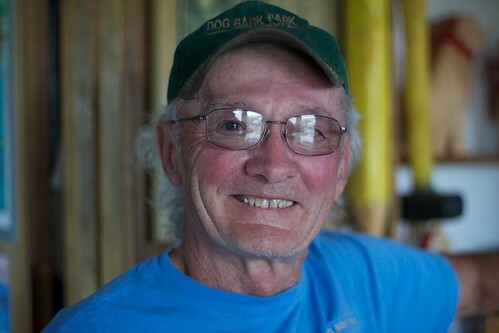 Dennis and his wife also do wood carvings of dogs and other things, as well as chair saw art on a bigger scale. There was a giant hydrant hiding a spot a pot, big letter blocks spelling out ‘DOG”, a giant toaster, and a set of human characters (each named) that had a story- apparently, little Rodney on his bicycle seems to be freaking out my friends. Rodney is poised at the roadside, looking as if he is going to jump the ditch, designed to make people slow down. Dennis was such a kind soul, consented to an audio interview that is part of my StoryBox, which means for now, I cannot post the audio. But he talked about his craft, his love of dogs, and what is special about living in this part of the country. He talked alot about the other kinds of buildings around the country designed to look like non-building objects, flipping through several volumes of picure books. These include Miner’s Hat Realty in Idaho, Longaberger Basket Company’s building… that looks like a giant picnic basket, and Lucy the Margate Elephant. And he wove a wonderful tory about the dream that became real as Missoula’s Carousel. This is the real American to look for on the road, not the plastic boxes and pastel malls that litter the 6 lane arteries. Dennis seemed to be urging me to draw my travel map to include these roadside replica structures.